Promoted by the alumni of IIM & IIT, the school is having more than 35 years of experience in the field of education. The Indian education industry is on a brisk growth track. The industry has witnessed significant developments and investments in the past five years, owing to which its market size reached $50 billion in 2012. Experts believe that the sector will surge to $200 billion by 2017, with a compound annual growth rate of 25.99 per cent. The Indian education sector currently enrolls around 450 million students and its estimated growth rate over the next decade is in the range of 10 per cent to 15 per cent. Among the various segments of the education industry, preschool has been catching the eye of many investors. This segment caters to children in the age group of 1 to 4 years, the period when a child is too young to enter into mainstream formal education. According to the research report “Indian Preschool Market Forecast”, the preschool market is set to thrive in India, with market revenue anticipated to grow at a CAGR of around 13.5 per cent during 2015-2018. This growth will be driven by numerous factors including rise in disposable income, working mothers, nuclear families, and escalating demand for high quality preschool education for toddlers. Tell us about Leaders play school. What is the USP of Little Leaders? 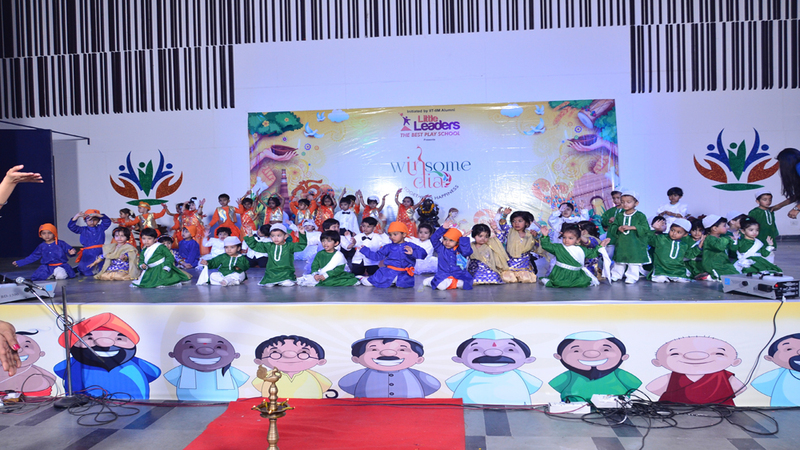 Little Leaders Play School is an IIT/ IIM alumni initiative backed by strong background in education for Formal School & Play School field for 50 years. Little Leaders has high-quality curriculum, training, assessment, and on-going-support capability. The single goal of all the teachers in 'Little Leaders' is to provide children with a culturally sound environment, the right values, love and protection needed for a healthy body, mind and soul in the most critical phase of a child's growing up years. What challenges did you face in your journey? How did you tackle them? It is never too easy to start anything afresh but the kind of backbone we have, the challenges went off smooth. One main challenge which we faced was lack of guidelines for the Play School industry by Government due to which the amount of respect and seriousness this industry should get, we all are not getting as an industry overall. Do the existing and other upcoming preschools pose a threat to Little Leaders? No, not at all. Till now if we see the data, less than 12 per cent of the eligible population go to schools, so we assume there is big opportunity as per industry and as we know what we deliver and how we prepare our child not only for admission into formal school but face the early childhood challenges. Give a brief of your business and revenue model. The play school industry is growing like mushrooms and out of that the branded and professional teams are very few. This is a low budget entry business which is recession free, but if we put it correctly, this is highly time consuming and requires a lot of hard work and dedication. We, at Little Leaders, being a professional team, want to run the Play School as a corporate entity where we have a lot of process so that every child who enters our any branch gets quality education, any partner who joins hands with us by taking our franchise will also get the best and fast ROI. Was it self-funded or did you raise funding? Please elaborate. As stated above we are professionals who joined hands together to start the venture, the core team being IIT – IIM Alumni. Being professionals, we want to work very transparently and with full business ethics, so we not only invested our own money into the venture, we also made our authorised capital in books to Government of India as Rs 5 million. In fact, all our branches are self funded whether company owned or franchise owned. What is your future road map? Highlight expansion plans. We are seeing a high potential in Tier II cities. Therefore, our strategy is to focus on not only the metro cities but also the Tier II cities too. We plan to grow our base from 25+ branches to 55+ branches by the end of this financial year. Where does technology play a role in early education? In today’s dynamic world when we all are surrounded by tech gadgets, how can our early learners be kept away? As per many doctors, maximum child development takes place during 2 to 6 years of age and at this age the child learns his/her own world by touching, feeling and exploring, so we emphasise more on video based or pictorial based learning as the kids might not be interested in listening or reading books but they are more interested in visuals, be it static or moving. Our whole curriculum is digitally made so that if they have a rhyme in a book, the same is available in video format also for better and fast learning. For example, if you see many cartoons like Tom & Jerry or Nick Jr. they will show more visuals and almost zero dialogues as with kids we have to go step by step. We firmly believe that early education and technology go hand in hand with bookish knowledge. Keeping in mind today’s generation, our curriculum demands for an interactive room wherein the kids come and explore through computers, specially designed software by our teams etc. Where do you see early education industry in 5 years? Where do you see Little Leaders in 5 years? As the brands have already proven their mark to the world and shown their importance to the society, now even Govt. is thinking of bringing this industry under regulatory guidelines, so we personally see that early education industry will see a growth of more than 30 per cent YoY from where it is now. Seeing the trend and being a professional company, we see a tremendous growth for us and our partners and we hope to have a minimum of 200 branches by 2021. Like Little Leaders, the preschool education in India has gained immense importance over the past five years due to increased awareness and affordability among parents. Further, increasing competition in education is prompting parents to plan their children’s future from early childhood. This has resulted in the growing popularity of preschools in India. With a market size of $ 0.75 billion, the preschool segment is the newest and fast growing entry into the education industry of the country. The preschool segment is expected to generate revenues of $ 3.24 billion by 2017. This will be propelled by increased investments by existing companies and by expansion into smaller towns and cities of India. Making India the next education hub..